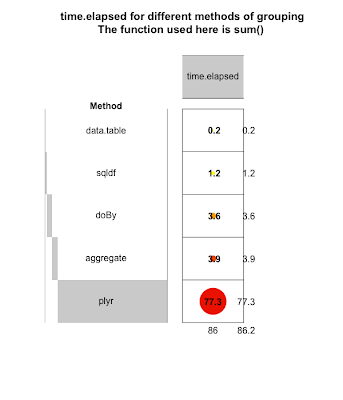 Recipes, scripts and genomics: Applying functions on groups: sqldf, plyr, doBy, aggregate or data.table ? Which one of the sqldf, plyr, doBy and aggregate functions/packages would be faster for applying functions on groups of rows? I was wondering about this earlier in this post. It seems sqldf would be the fastest according to a post in manipulatr mail list. 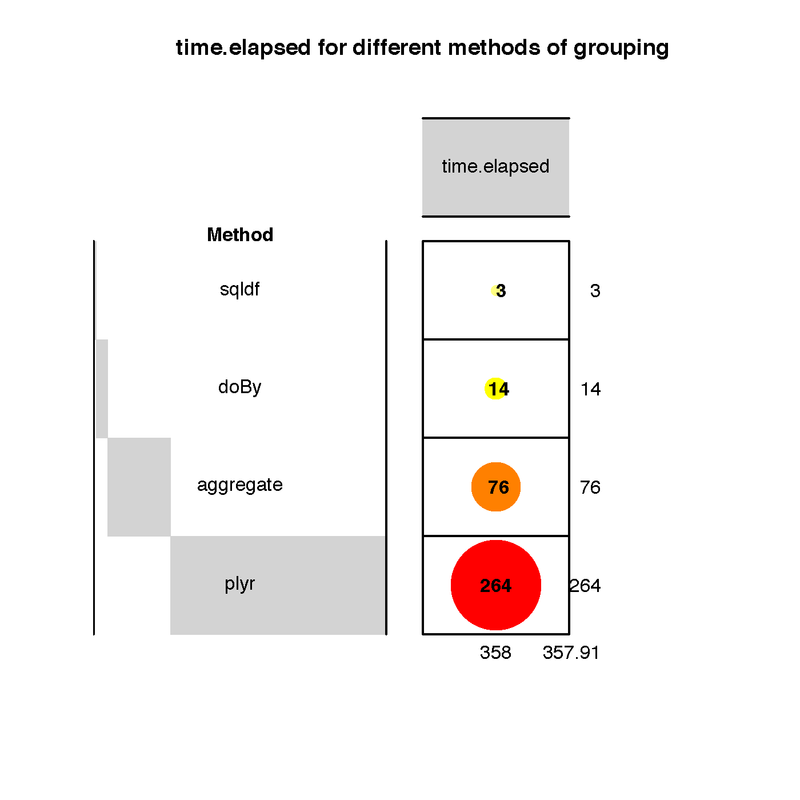 The downside of sqldf is that you will be able to use only sql functions on groups, but in the rest of the other options you can apply R functions on groups. EDIT: I repeated the experiment on my own computer, this time I included data.table package as well. 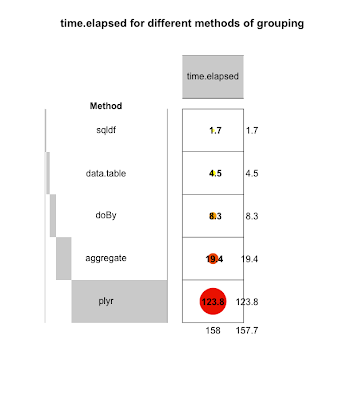 The new experiment shows that sqldf is still the fastest but data.table ranks second now. But I have been warned that the mean() function has large overhead and in fact if I use .Internal(mean(x)) instead of mean(x) for the group operations, data.table is the fastest!!! Scroll down to see another comparison of the grouping functions, this time using sum() function which doesn't seem to have a large overhead. The code is below. I mostly copy-pasted from the post at manipulatr, except the data.table part and the plot. 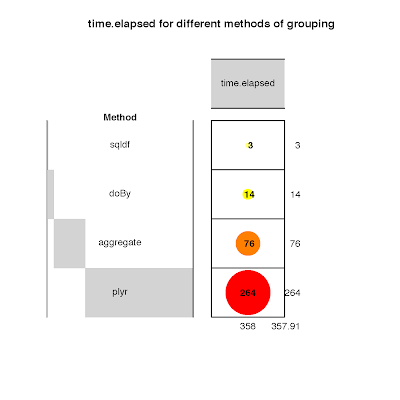 EDIT: More unbiased way to measure this is to use sum() function on groups. When I do that, data.table comes first! Perhaps you could give data.table a try. Thanks, I followed your suggestion and added data.table as well. Not a huge time saver but in the aggregate function the FUN argument can be just "mean" instead of "function(x) mean(x)". It seemed to save about a second on my system. Thank you for the short study. Been a plyr user, but looking at this I am definitely going to give the others packages a try. Any of the other packages have shortcomings compared to plyr? Thank you for your suggestions Larry and ts. Indeed when I use .Internal() data.table is the fastest!! John, I don't have a lot of experience with plyr. Right now, I'm using sqldf. I learned about data.table yesterday. Seems like I will be using that too. (1) The calculation of DT from d was left out of the timing. 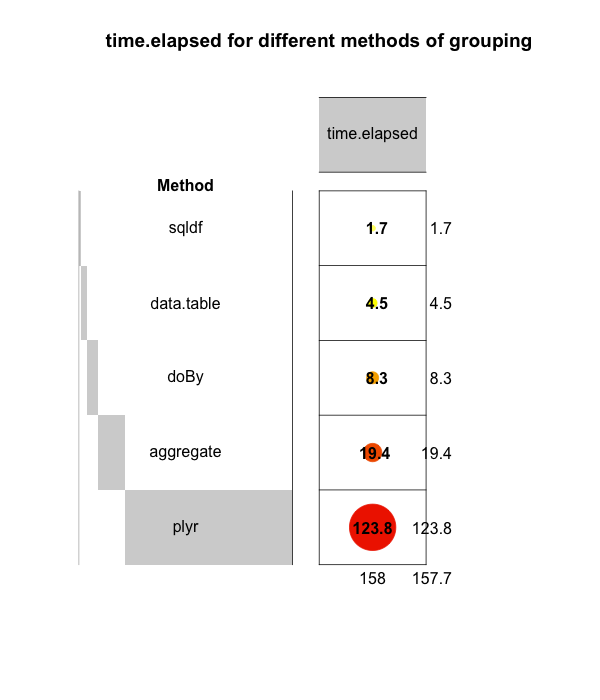 The timing for data table is therefore larger than shown. (2) The statement that using sum is more unbiased seems strange. Both summation and averaging are common operations that represent real usage cases. This is data dredging where you use different variations of the benchmark until you find one where you like the result. (3) The fact that minor changes in the benchmark can cause the order to change shows that the conclusions of one particular benchmark cannot be relied upon. (4) Other criteria that might be used but were not mentioned would be ease of specification and whether the method can handle intermediate results larger than memory. Some good points there! I encourage anyone who is interested to do a better planned analysis. Unfortunately, I don't have any more time to dedicate to this. I bet adding the keys to the data.table should speed it up.